In the icy Northern Wastes, a mighty army of darkness prepares to sweep southward and lay waste to the civilised lands of the Empire. In this dangerous time, retired Imperial general Kaspar von Velten is sent to Kislev as ambassador to the court of Tsarina Katarin. Unused to the power struggles and politics at court, Kaspar is forced to use all the skills and resources at his command in order to survive in this cold and hostile land. As winter draws in, can Kaspar re-forge the fragile alliance between the Empire and Kislev and prepare its troops for war before the hordes of Chaos are unleashed on the land? This great value omnibus contains the two novel The Ambassador and Ursun’s Teeth. The Ambassador Omnibus is a two part Warhammer story set in the cold, eastern land of Kislev, full of intrigue, scheming, blackmail and, of course, battles. Because let’s not forget, the Black Library novels are set in the world of Warhammer Fantasy Battles. 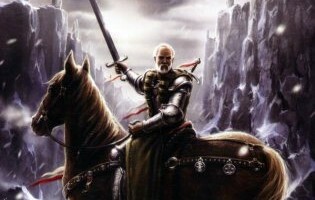 Part of the idea behind writing the Ambassador books was that I fancied a break from the hack and slash of the 41st Millennium to see if I could write stories where the suspension of disbelief wasn’t so great, where there was a more obvious connection to the kinds of characters we’d meet in a fantasy novel. Writing stories set in the dark, gothic worlds of the far future is great, but its easy to fall into the trap of thinking that your characters don’t need to act believably simply because they live in the most insane universe imaginable. I wanted to write a story set in a world which, though fantastical, was much more accessible to the reader, where recognisable human characters could exist – and to see if I could write them in a believable way. My first steps along the road that led me to writing a fantasy novel began with the purchase of the Fighting Fantasy book, ‘The Warlock of Firetop Mountain’, a dog-eared copy of which still sits on my bookshelf as a fond, nostalgic reminder of more innocent times, when all we wanted out of a fantasy book was to kick open the door, kill the goblin and steal his 10gp. Of course it wasn’t as simple as that, but we’ve all grown up a little since then and now we want something with a little more meat to it. The times where the heroes wore white hats and the bad guys wore black hats are behind us and we know now that people can’t be defined so simply. Good people are capable of terrible acts and those we think of as evil can surprise us with acts of great heroism. I wanted to challenge what we thought we knew about the characters, to invest in flawed heroes who face uncertain choices in a dangerous world. I wanted the reader to cheer for heroes with all-too-human weaknesses and see if we’ll still embrace them if they fail, because I don’t believe that to portray them as flawed creations weakens them, it strengthens them. Out of all this weighty pontificating came the characters of Kaspar von Velten and Sasha Kajetan, who, once you’ve read the two books, represent the culmination of that thinking. To an extent they all do, because I wanted to turn the dynamic of most of the characters around from what you expected. The relationship between Kaspar and Pavel develops beyond the usual ‘hero and sidekick’. The relationship between Chekatilo and Kaspar also changes to become more than just protagonist/antagonist. This all sounds pretty grand, but don’t get me wrong, I’m not trying to write Great Literature that kids will be forced to read in school, I want to tell a ripping yarn with good characters, interesting plots, a truckload of battles and to really bring home the dark, twisted world that is Warhammer. These were fun books to write, though they were almost just the one book. When planning the book out with the Black Library, it became abundantly clear that there was more plot than could be squeezed into one novel and, rather than cutting out loads of bits to get it all to fit in, I decided to write two books, back to back, in a Matrix kind of way (though hopefully without the disappointment factor the sequels to that movie engendered). The plan was to finish The Ambassador then plunge straight into Ursun’s Teeth. Of course ‘the best-laid schemes o’ mice an men gang aft agley’ and that didn’t quite happen, with me taking a rather too long break between finishing one book and starting the next. But deadlines have a wonderful habit of focusing the mind when they are set to drop on you like a lead weight, and Ursun’s Teeth was written in a flurry of stabbing at the keyboard, late nights and enough coffee to keep the Columbian economy afloat for years to come. Once they were finished, and I read the manuscript in its entirety, I saw that they veered towards a darkness that almost went too far in some parts. But as anyone who’s ever read any of my books can probably testify, they all take that road for a little while. Bits of the book shocked and horrified me – and I wrote them! – but I didn’t ever feel that they were gratuitous. If I’d felt that, I’d have cut them out. Upon publication, the books got some pretty good word of mouth and seemed to sell well enough (helped immeasurably by stunning Paul Dainton cover art). I’m very proud of them and my first foray into fantasy proved to be an overwhelmingly positive experience for me.